Krishna is considered the ultimate personification of love, friendship, trustworthiness and selfless service. Sri Krishna Janmashtami, therefore, signifies not simply a celebration of the birth of a great and Divine Teacher of mankind, but the recognition of that inherent Divine Power in all of us, which enables us to proceed in all of our worldly activities with a sense of higher spiritual purpose. 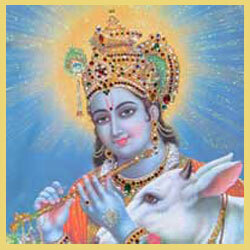 Krishna Jayanti is considered one of the greatest Hindu community festivals. It falls on the eighth day of the dark half of the month of Bhadrapada; this year on August 14th, and is marked by grand celebrations at Krishna temples across India. The festival itself is preceded by a day-long fast that is broken at midnight, the time when Krishna is believed to have been born. Born in 3,228 BC, Sri Krishna is the eighth incarnation of Lord Vishnu, the Hindu representation of Almighty God, and is considered to be the Lord’s most glorious incarnation. Hindu tales are rich with the exploits of his life, a life that is a stirring saga of one of the greatest champions of dharma (duty, selflessness and righteous action). From the moment of his birth in the dungeons of the tyrannical ruler Kamsa, his life is replete with mortal dangers, which he successfully triumphs over. He is said to have killed many demons, tamed the serpent Kaliya and even lifted a mountain to protect the people of Vrindavan from torrential rains. Himself a king, Krishna played many roles in his life. He was a musician, a cow-herd, master of the arts, a benevolent ruler, righteous statesman and a teacher of the highest principles. He was the unchallenged hero of his times both in terms of his bodily prowess and intellectual brilliance. Nowhere in any scriptures has there been recorded a life more full, more intense, more sublime and grander than that of Lord Krishna, which makes it easy to understand why Krishna Janmashtami is celebrated with such passion and grandeur all across India. At the epicentre of the great Indian epic, Mahabharata, we find Lord Krishna, charioteer to Arjuna the leader of the Pandava army at the commencement of the battle at Kurukshetra. Despondent and dejected at having to do battle against his former friends, family and loved ones, Arjuna is counselled by his friend Krishna who proceeds to instruct him on duty and right action. The 700 slokas, or stanzas of this penultimate moment in the greatest of Indian epics is known as the Bhagavad Gita, when Krishna gives instruction on karma yoga (selfless action), bhakti yoga (devotion), jnana yoga (knowledge/wisdom) and on the proper yogic attitude to take towards every human crisis. The Bhagavad Gita remains today the widest read piece of literature of all time.